Late last year Apple said the white iPhone 4 was coming in “Spring 2011” but it looks like the launch of the White iPhone 4 is just around the corner. 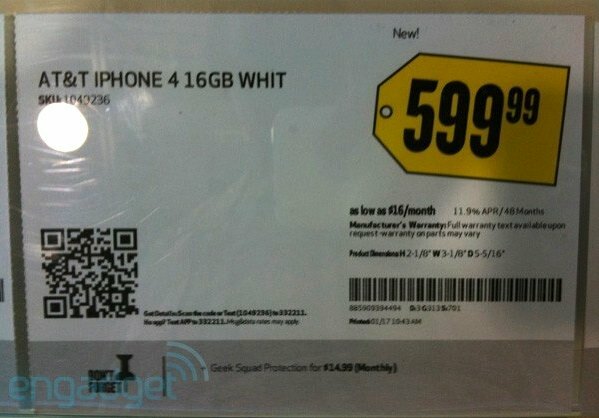 A tag labeled as “AT&T IPHONE 4 16GB WHIT” with an inactive SKU turned up at a Houston based Best Buy store, shown in the picture above from Engadget. This was followed up by a similar image appearing at a Canadian electronics retailer, also with a clearly labeled white iPhone 4 tag for when the device goes on sale. If stores are already setting up for a launch, we just might be seeing the much anticipated unicorn iPhone in the very near future.